Located in Allentown, Pennsylvania, the Allentown Art Museum showcases multidisciplinary works spanning more than 2,000 years of human history in the Americas and beyond, offering gallery exhibitions and public special event programming to the Lehigh Valley area. The Allentown Art Museum was the vision of educator and artist Walter Emerson Baum, who began a grassroots campaign in the 1930s to create a public art museum for the Lehigh and Bucks County areas. As an arts advocate for the eastern Pennsylvania region, Baum was also the founder of the Baum School of Art. The museum was officially opened to the public in 1934 in Allentown’s Hunsicker School, showcasing 70 works on canvas by local eastern Pennsylvania artists with its first exhibition collection. As a result of the museum’s public success, two years later, the museum was given a permanent home by the City of Allentown within a historic home facility within the city’s Cedar Park. The museum acquired large expansions to its collections over the next several decades, including a gift of more than four dozen Baroque and Renaissance works by local philanthropist Samuel H. Kress. In 1975, the museum building was renovated to accommodate expansions to its gallery and educational programming space, and in 1978, the museum’s mission was refocused to expand its American art collections. 10,000 square feet of additional gallery and public use space was added to the facility in 2011 to accommodate growing collections. Today, the Allentown Art Museum is located within a Federal-style historic home facility in the Rose Garden section of the city’s Cedar Park, offering a variety of gallery exhibitions and public educational programming to the Lehigh Valley community. More than 100,000 visitors and program participants are served by the museum annually, including 14,000 annual participants in the museum’s K-12 student educational programming. Exhibitions are geared toward broad public audiences of all ages, with educational and public special event programming available for students and community members of all ages. More than 17,000 works are showcased within the museum’s permanent collections, which focus on multicultural and multidisciplinary works spanning more than 2,000 years of human history. Major collections include an American Painting and Sculpture Collection, which showcases American works dating back to the mid-18th century with a focus on the works of eastern Pennsylvania artists including Nelson Shanks, Harry Bertoia, Franz Kline, and Wharton Esherick. A European Painting and Sculpture Collection presents more than 100 European Old Master works, with its basis in the 1961 donation of 61 works from the private collection of local philanthropist Samuel H. Kress. European works on display at the museum include Renaissance and Baroque works by Italian, German, Dutch, and Flemish masters dating back to the 17th century. An Asian Art Collection also contains more than 1,900 multidisciplinary works by Chinese, Japanese, Indian, Nepalese, and Tibetan artists, including a special collection of Japanese woodblock prints. Special museum collections include a Textile and Costumes Collection showcasing works produced on five continents over the course of 16 centuries, serving as the museum’s most globally-diverse collection. A Prints, Drawings, and Photographs Collection includes more than 400 Renaissance-era prints and a retrospective collection of 20th-century American printmaking works, along with a sizeable collection of contemporary photography. A Decorative Arts Collection also focuses on British silver, Tiffany glass, and Americana and Arts and Crafts movement pieces. In addition to collections-focused gallery exhibitions, the museum displays the preserved Frank Lloyd Wright Library, recovered from the Francis W. Little House prior to its demolition in 1971. The home’s living room was transported to New York’s Metropolitan Museum of Art, while its library, designed by the famed 20th-century American architect, was relocated as a permanent display exhibit at the Allentown Art Museum. 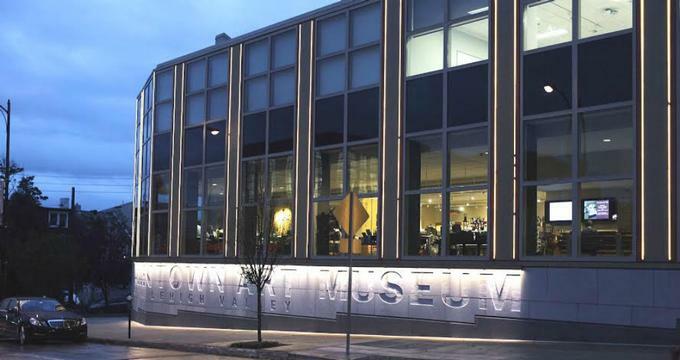 A museum cafe is also offered, featuring healthy fare by award-winning local caterer Karen Hunter and a view of Allentown’s downtown skyline and Arts Park area. More than 14,000 Lehigh Valley-area students are served annually as part of the museum’s K-12 educational programming, which includes curriculum-incorporated field trip tours for elementary and secondary school students. Other student educational programming includes a teen advisory board program, a teen docent and internship program, and art workshops with local multidisciplinary artists. City Arts arts camps are also offered periodically for children and youth. For community members, a variety of art-related programming is offered, including a lecture series, an art and lunch program, panel discussions, and free Sunday events offering docent-led tours and family-friendly Art Ventures programming. Regular public special event programming includes a Third Thursday evening open gallery event, an annual “Poetry Out Loud” contest, and an annual showcase of local student artwork. The museum also facilitates a variety of community outreach programming, including its HeARThstone program, which brings artists-in-residence to local community events and festivals.